If ever there was a perfect collection for me it would have to be the Jo Malone Just Like Sunday quartet. Four scented candles (hello my obsession) all based around the various chilled out vibes that only the end of the week can only bring, yes we are of course talking about Sunday (it is only my blinking blog name). These candles in a sense literally (let's not get too carried away) have my name all over them! Excited? You bet your last penny I am. "A pause in the week. To relax in crisp, white sheets, airy with lavender. To unwind...and go wherever the mood takes you.Out to the garden. Into the greenhouse, twisting tomatoes fresh from the vine. Earthy, leafy and full of sunshine. A hearty lunch. A breezy walk. Then paradise. A plate of sweet almond macaroons with a pot of steaming tea. Vanilla-soft and coconut rich. Sleepy by the fire. Smoky incense curling into the air. No need to think. Easy... Just Like Sunday "
The line up of course comprises of four scented candles (if you have yet to experience a Jo Malone scented candle you are in for a treat) each of which has been created by Style Editor Charlotte Stockdale. Just Like Sunday will be available worldwide from January 2014. I best start saving now in that case! 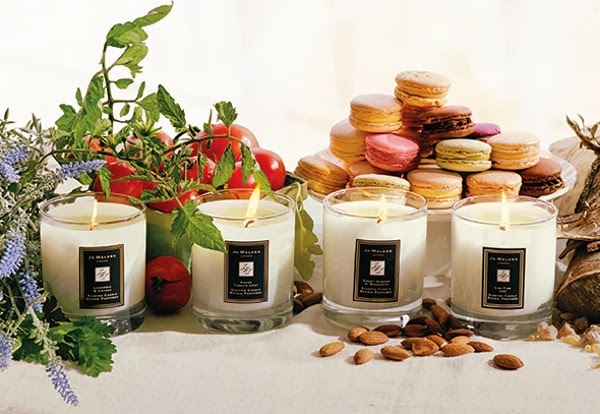 The Jo Malone Just Like Sunday quartet comprises of : Lavender and Lovage, Green Tomato Leaf, Sweet Almond and Macaroon and lastly Incense and Embers. Something to compliment each and every type of Sunday wouldn't you agree? Lavender and Lovage has been blended with envisions of crisp white sheets and the comfort of clean lavender scented linen. Doesn't your body now ache for a long lie on a spring morning? It is said to be a clean but a calming aromatic offering featuring notes of lavender, garden lovage, rosemary and thyme. Green Tomato Leaf was inspired by glasshouse tomatoes and if memory serves me right I am sure this is a personal homage to the creator in some sense, don't quote me on that. Notes are said to include galbanum, artemesia, cassis and moss. Earthy, green and serene - perfect for a day of baking or sitting outside enjoying all nature has to offer. Oddly I see this to be fitting for the Autumn, perhaps it is the moss and tomato leaf hinting at harvest? Sweet Almond and Macaroon will undoubtedly be the best seller. I see this as an at home offering of a high tea with crumpets and a steaming pot of tea. One for all those ladies who lunch. It is said to be a sweet yet rich composition, heavily featuring sugary sweet notes of almond, coconut, cherries and vanilla. Yum! Lastly there is Incense and Embers which I think will be perfect for a Sunday (or any day of the week for that matter) evening burning. Reading the notes I couldn't help imagine a cosy night in front of a blazing fire with a mug of somthing warm and a great book. Perfect for preparing for the hectic week ahead. Jo Malone Incense and Embers is listed as a contemplative and relaxing infusion of notes which include Incense, silver fir, white pepper, napa leather, vetiver and amber. Keep your eyes peeled for the Just Like Sunday collection launching January 2014. Sweet Almond and Macaroon for me please!!! Shame they're not out in time for Christmas, I think this would make a lovely gift! The sweet almond and macaroon sounds good enough to eat!, will have to keep an eye out for these in January. These sound amazing, especially sweet almond and macaroon! These sound amazing. I love a good candle! Sweet almond and macaroon? Sold. I can't wait for this collection to be released. Nothing gets me more excited than a new candle.